Here is why we launched Finstead Mutual Funds: for a while, if you’ve tried getting synthesized information on funds, such as performance, cost, risk and expenses that you can interpret easily, it would’ve taken you ages to get the insight you need to make your investment decisions. 1. The Magellan fund is more volatile, hence riskier, than Vanguard S&P 500 funds. 2. 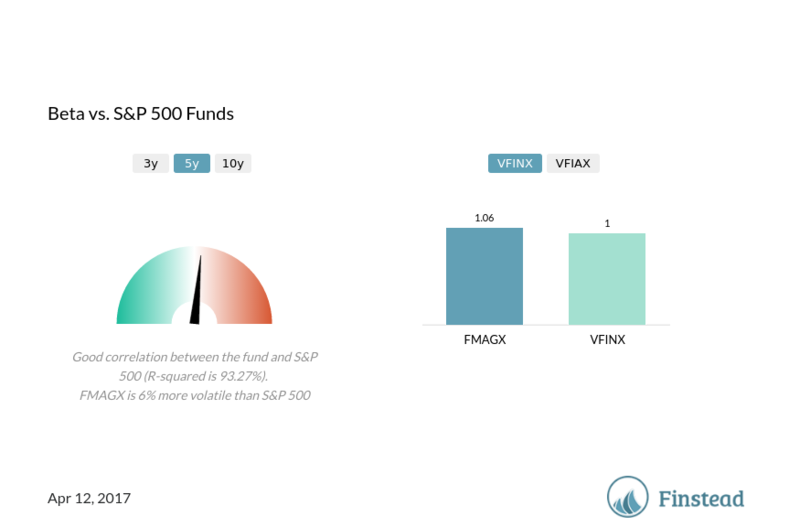 Over the last 3 years, FMAGX returned 1.67% less than VFINX (S&P 500 fund). 3. The Sharpe ratio for FMAGX is below 1, which indicates a less desireable risk reward profile (and less desirable vs. S&P 500 funds). 4. The fund is less expensive than the average mutual fund, but more expensive than the average ETF. As the number of mutual funds surpasses the number of stocks traded on the US stock exchanges, it’s increasingly difficult to analyze all of the funds. Finstead mutual fund analysis and insights are meant to help you navigate the mutual fund space. Don’t settle with just fund ratings—research has repeatedly shown that the ratings are not correlated with fund performance. Understand elements that drive performance—cost, tax efficiency and risks—and know what you’re investing in so you wind up buying a fund that you have your head around as opposed a fund that was blindly recommended to you.